For communities across the Global South, the impacts of climate change are not abstract projections but concrete realities that threaten their land and food security. In the wake of the dramatic findings of the Intergovernmental Panel on Climate Change, which predicts major consequences of human-caused climate change as soon as 2040, this year’s World Food Day holds grim significance for the millions already experiencing climate-related food insecurity. “Hotter, Drier, Hungrier” reported the New York Times about the 12 million people who rely on food aid across Kenya, Ethiopia, and Somalia, countries deeply affected by higher temperatures and less rainfall. Migrants from the most vulnerable regions of the “Dry Corridor” in Central America—home to an estimated 10.5 million people across Guatemala, El Salvador, Honduras, and Nicaragua—report that food insecurity is a primary driver of their exodus. An estimated 10 percent of people there suffer from malnutrition. Persistent drought across India has consumed countless harvests and left more than half of the country experiencing high to extremely high water stress. An estimated 15 million farmers, facing worsening cycles of drought and debt, have abandoned their land. Increased temperatures, variable rainfall patterns leading to both drought and flooding, and the ensuing geographic spread of crop pests and diseases associated with climate change pose considerable challenges to agricultural production. With more than 820 million women, men, and children chronically undernourished globally, adverse climatic conditions are exacerbating the food crisis. To make matters worse, the communities weakened by food insecurity—the majority of whom already live in poverty—are often the most vulnerable to climate change due to their reliance on rain-fed farming methods. This is a perpetual cycle of instability. International commitments on climate action have primarily favored mitigation over adaptation efforts, and funding contributions from wealthy nations remain far behind previously agreed upon thresholds. While the entire global community must play a role in curbing the anthropogenic drivers of climate change, many developing countries, who bear little historic responsibility for the current climatic conditions, are the ones primarily confronted with its consequences. A farmer in Rwanda standing in front of her land. Women, men, and communities across the Global South can’t wait for funding pledges to be fulfilled, much less, for global mitigation efforts to take hold. Climate change is not something of the future. Adapting food systems to the new climatic reality is an urgent challenge that developing countries and their communities are facing, now. Under the right conditions, smallholder farmers—who are at the forefront of climate risks—are not powerless to adapt to the changing realities. They can adopt a variety of practices to bolster agricultural production necessary to sustain their livelihoods and curb food insecurity, minimizing price spikes and market volatility. Investing in irrigation technologies, building terraces, intercropping, adopting agroforestry, and fallowing land, for example, can help cope with less available water and changing temperatures. These practices contribute to the long-term health of the soil while bolstering the yields and diversity of food produced, with beneficial impacts on household nutrition. So why aren’t more smallholders and communities readily adopting these “sustainable land management” and “climate-smart agriculture” practices? Limited resources and access to information are two key barriers. But there is another major and often overlooked factor: insecure land rights. Many smallholder farmers in the Global South may not feel secure enough in their ownership and management of land to invest in adaptation inputs and practices. Imagine the perspective of a farmer whose land is dry and production withering. He may have heard about the benefits of building terraces in his fields to increase water retention in the soil. Such an investment would require an initial output of time, labor and money to construct. Without the security and protection that comes with legally recognized and documented land rights, he may not be confident he will fully reap the benefits of his investment. Now, imagine you are a woman living in one of these communities. You face these same barriers but are doubly burdened by gender-based discrimination in social norms and practices—sometimes even the law—that determine how land is owned and managed. Chances are, you have not been consulted by your family or fellow community members about how best to adapt to the changing environment. Yet you hold valuable information about the land you have invested in throughout your life. Even more, as food becomes scarce, your own health is most at risk, with the nutrition of male household members prioritized above your own. What if you were recognized as the steward of that land? With land tenure security, women and men in rural communities across Asia, Africa, and Latin America can take action to adapt to a changing climate. Secure land rights, especially for women, can encourage farmers to make investments and uptake sustainable practices that conserve soil and water, bolstering short- and long-term food security. 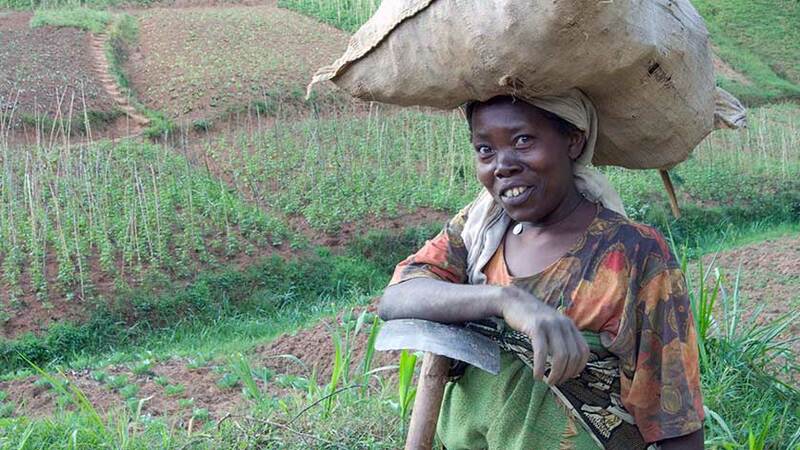 FAO reports that women’s land rights are a key factor to increasing conservation agriculture, small-scale irrigation, and planting of stress-tolerant and high-yielding crop varieties, all of which have high impact on food security and nutrition. Most importantly, tenure security can provide a more enabling environment and access to resources for women, men, and communities to make land use decisions that are best for them, their families and successive generations. Enhancing national commitments to secure land tenure within international agreements on climate action and sustainable development could improve current adaptation efforts and their outcomes. It could also be a cost-effective way to address food insecurity—as well as poverty, gender inequality, economic growth, sustainable livelihoods, land degradation, conflict, and other priorities within the Sustainable Development Goals. With climate adaptation woefully underfunded and a global community competing for resources across issue-areas, land tenure security can soften the soil for rural smallholders and grow climate resilience. Climate change is forcing rural agricultural systems to adjust. Country contexts and local realities vary, including the arrangement of land and resource tenure systems; in many cases, land tenure is only the beginning. But a strong foundation, literally, is often a crucial prerequisite to investment in climate adaptation infrastructure and sustainable land management practices that are necessary to bolster food security, especially in a changing climate.